Introduction to antioxidants; Chemistry of antioxidation; Antioxidant action in multi-phase systems; Antioxidant protocols for foods and biological systems; Food antioxidants; Antioxidants in biology; Browning and glycation reaction products in biology; Future perspectives; Glossary; Abbreviations. The field of antioxidants has expanded over the last six decades into a wide variety of multi-disciplinary areas that impact foods and health. 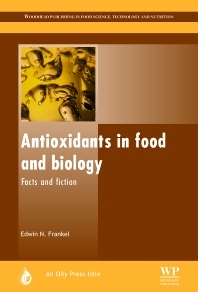 Antioxidants in food and biology: Facts and fiction is a handbook designed to help all those who need to prevent or control oxidation, especially in food products, or to understand the properties of antioxidants in food, nutrition, health and medicine. It conveys the complexity of antioxidant chemistry by providing an appreciation of the various phenomena that affect oxidation and its inhibition in foods and biological systems. Beginning with the underlying chemistry, the book moves on to explain how the activity of antioxidants is affected at the interface of complex multiphase lipid systems and to discuss the problems of evaluating the activities of antioxidants in foods and biological systems. After reviewing the antioxidants present in various foods, the author addresses the hypothesis that the health of an individual is influenced by the efficiency of various protection systems against oxidant damage. He also considers whether or not additional or more effective natural antioxidants are needed in our diet to reduce oxidative stress from dietary and environmental factors, and to thus reduce the risk of cardiovascular disease. Edwin N. Frankel, University of California, USA.